Viewing the mighty Niagara for the first time stirs images of tranquility, power and magic.Viewing the Mighty Niagara for the first time stirs images of tranquility, power and magic. 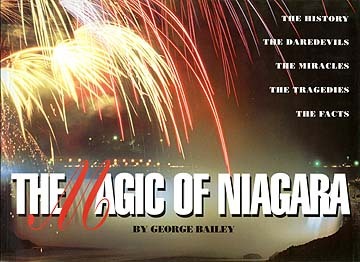 The story of Niagara is 12,000 years old, and author George Bailey skillfully captures the historical highlights in a book that contains a riveting text and more than 100 photographs. Many of the photos are from the mid-nineteenth century and offer a nostalgic view of the Falls. Bailey also looks at Niagara in the winter, the Maid of the Mist, famous daredevils and the Niagara Parks Butterfly Conservancy.